What matters is who you've become." PS Thank you so much for all the sweet comments about Matilda Mae....you will see her again soon. Looks like something's been trying to jump that one. Oh... I love this shot. Memories of a time go by. When I was a very little girl there was a lot of this type of fence in Chicago backyards. To answer your question, yes, that is corn growing, one or two local farmers plant feed corn on all the remaining small plots. Love that quote! Great picture, too! Meaningful quote, a fence to remember . . . I have a love affair with fences!!! A good quotation and I like the selective focus on the fence! I love fences and that one beats all! I like that quote . . . I'm always collecting good quotes to put on my kitchen chalk board. I like to change them two or three times a month. or how wonderful our life's journey is and how we are never alone:). I feel just like that fence looks - a little bent, perhaps a little worse-for-the-wear, but still serving a purpose and holding my own. 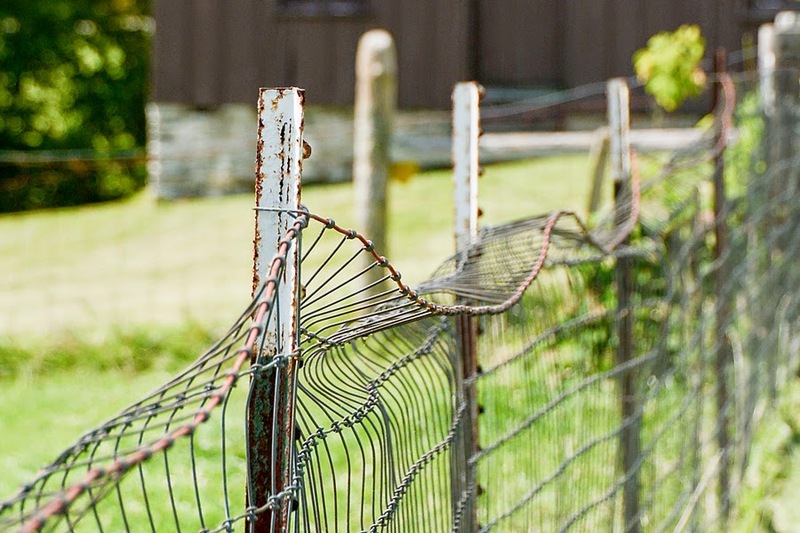 I don't have to go too far to see fence that resembles this one! We still haven't pulled posts and built a new fence. One of these days! Super cool shot. Love the bended wire and the rust. Oh gosh, not sure which I like more, the cool fence or that most wise quote?! Love the rusty, bendy fence and the beautiful quote. Looks like someone climbed over. Good eye on your part, and great composition. I like it a lot.